By Dr. Karyl McBride, Ph.D. The bestselling author of Will I Ever Be Good Enough? : Healing the Daughters of Narcissistic Mothers draws on her expertise in treating men, women, and children damaged by narcissists in this practical guide to divorce and its aftermath. Narcissism—a personality disorder that goes beyond mere selfishness and vanity—is a prevalent cause of marital and family problems. Narcissists do not have the capacity to love, understand other people’s emotions, or feel empathy. They are grandiose in their need for praise and attention, they overestimate their abilities, and they diminish people around them with emotional abuse. Being in an intimate relationship with a narcissist destroys your hopes, dreams, and peace of mind and erodes your children’s emotional health and your finances. Does this sound like what you have to deal with? If you ever look at your partner and wonder in despair if you will ever be free, the answer is yes, you can be. A leading authority on narcissism, Dr. Karyl McBride offers proven therapeutic advice that will help you protect and nurture yourself and your children through your difficult divorce, from separating from your narcissistic partner and navigating the court system, where a narcissist can be especially destructive, to a restorative healing program of trauma recovery. Karyl McBride, Ph.D., is a licensed marriage and family therapist with more than thirty years of experience in public and private practice, specializing in treatment of trauma. 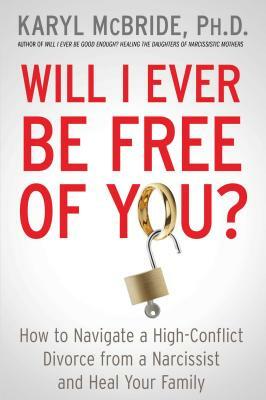 She is a leading authority on narcissism and author of Will I Ever Be Good Enough? Healing the Daughters of Narcissistic Mothers. She is a contributing blogger for Psychology Today, Huffington Post, and her recent book was featured in the New York Times book club. Dr. McBride can also be found online at WillIEverBeGoodEnough.com, KarylMcBridePhD.com, and Facebook.com/DrKarylMcBride. — S. Scott Lasher, Esq.